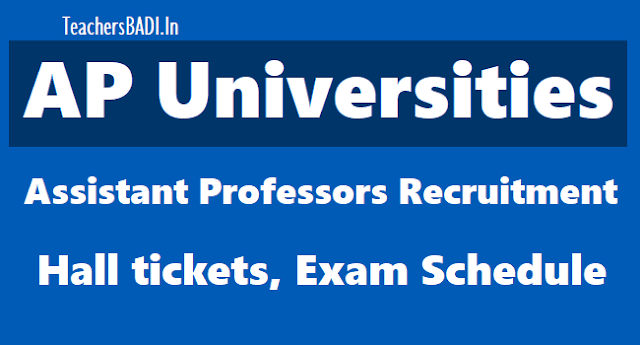 AP Universities Assistant Professors Recruitment Hall tickets 2018, AP Universities Assistant Professors Recruitment Exam Schedule. Screening test for recruitment of Assistant Professors in various Universities of Andhra Pradesh, the Hall Tickets will be available for download on 03/04/2018 afternoon onwards at psc.ap.gov.in. Candidates may download the Hall Tickets and are advised to check the location of their test centre so that on examination day no hurdles are faced in locating the Centres. Assistant Professors Recruitment screening test marks /Results are released by the APPSC. After, Interview should be conducted by the AP Universities. Step 2. Search for "Marks list link"
Step 3. Then, "Marks of all Appeared candidates for Asst professors in AP Universities page" will be opened. Step 5. Download the file and save OR take a printout for future use. The Andhra Pradesh Public Service Commission APPSC has released the hall ticket for the assistant professor’s examination paper 2. The hall tickets are released on the official website. The candidates who have applied for the post can download their admit card from the official website psc.ap.gov.in. The steps to download the admit card is provided below along with the direct link. the exam will be conducted on April 26 and 27 at Visakhapatnam and Vijayawada centres. 4. Hall ticket will be displayed on the screen, download the hall ticket and take a printout for future use. The APPSC is conducting the Assistant Professor (Paper II) exam for the post of - Labour Welfare & Human Resource Management, Yoga, Geophysics, Meteorology, Ocean Sciences, Geo-Engineering and Naval Architecture & Marine Engineering. The candidates are also advised to take the hall tickets along with them in the examination.An official notification is released on the website stated that "Candidates are not allowed to bring any electronic devices and gadgets such as Mobiles, iPod, Calculators. Handbags, writing pads, Pens, are also not allowed. Rough sheets and Pens shall be provided by the Invigilator to each candidate so that they need not carry any articles with them. Prohibited articles will not be allowed into the centre and in no case in any examination hall." AP Universities Assistant Professors recruitment screening test Hall Tickets are available for downloading for Notifications given by the following Universities. Step 3: Click on the Hall ticket download link and then will be hall ticket dowbload web page will be opened. Attention: Applicants for the Screening Test of Assistant Professors of notifications issued by the Andhra University, Visakhapatnam : As per the oral Communication received from Andhra University at 8:00 PM today (03/04/2018), the conduct of the Screening Test for Applicants to the posts in Andhra University is subject to vacation of stay by Hon’ble High Court.